Today I am sharing with you my love of wedges. For someone that has flat feet, works with kids all day and hates to wear high heals, but wants to dress up a casual outfit; wedges are a win-win. They can easily go from day to night in a snap and paired with shorts or a sundress, they can be worn all summer long! I found these Kenneth Cole Reaction wedges (above) at Marshalls for $30. 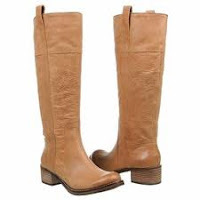 They are just the right height and even have a rubber lining on the sole which is perfect for a non-slip grip; not to mention I LOVE the rich but neutral camel color that go with anything and everything (the same reason I love these boots - below - that I purchased this past winter). I have worn these wedges many days to school and love that my feet aren't killing me by the end of the day. Comfort- standing on your whole foot rather than on your toes. Style/Versatility - can be dressed up or down for any occasion (you know I love that!). Durability - generally made from stronger materials with no risk of heel breaking off. Stability - more surface that touches the floor.